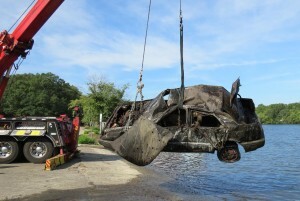 A government issued GPS tracking device was found inside a Chevy, Spectrum Tuesday morning, when volunteers from The Clean River Project (CRP) towed their 58th car of the summer from the Merrimack River in Lawrence. Divers had removed the plate before todays dive so that police could track down the owner. Lt. Conway told the Valley Patriot that the plate did not come back stolen and police are investigating. The Clean River Project was started in 2005 by Methuen resident Rockey Morrison in an effort to clean up the banks of the Merrimack River from Methuen to Haverhill. The group has taken hundreds of cars and more than 1,000 tires out of the river as well as appliances and construction barrels. Volunteers say that there were at least 15 fire hydrants in the river under the bridge. City workers said that they had been run over by snow plows in the winter and were dumped with the snow into the river. State Representative Frank Moran and State Senator Barbara L’Italien toured the river with volunteers from the organization including Valley Patriot photographer and candidate for city council, Rich Russell, writer Christine Morabito, Lawrence School Committee member Myra Ortiz and others. Senator L’Italien said that she was excited to see the progress being made cleaning the river and vowed to work with Senator Katy Ives (D-Newburyport) to possibly find state funding to assist in the cleanup of the river. To Donate to the Clean River Project CLICK HERE. But no bodies so far…good !